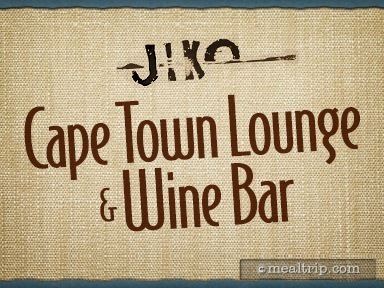 The Cape Town Lounge and Wine Bar is located near (or in) Jiko's and is kind of cool actually. The decor is South African and very well done, but not quite as elaborately as Jiko's main dining area. This smaller setting feels more intimate though, and while the space was intended as a location where you could partake in an appetizer and wine pairing prior to your table becoming available at Jiko's... you can go into the Cape Town Lounge without having reservations at the larger signature restaurant. The really cool part about that is, the full Jiko menu is available… so if you really want to sample some of Jiko's cuisine, but can't get a reservation, it's worth checking into this little known spot, and seeing if any tables were available.